Transform MPC to WAV audio files online and without registration! 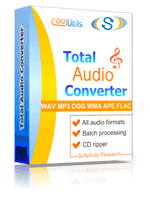 Use a MPC to WAV Online Converter or buy the batch Tool for more! Description MPC (Musepack) is a kind of audio compression format, which uses a compression pattern based on MPEG-1 Layer-2 and MPEG-2 algorithms and is optimized for variable medium high bitrates not exceeding 48khz. Bitrates vary according to the complexity of audio data. These parameters ensure effective compression with little detriment to sound quality. Although Musepack does show better sound quality than MP3, it is still not so popular because few audio players support it.